Whew! What a ride. 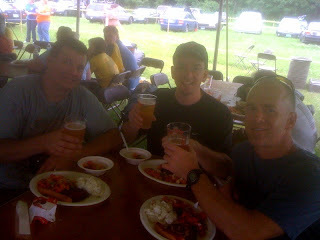 148 miles and 8000+ feet of climbing is a long way to go for a beer, but it sure tasted good when we got there. The Harpoon Brewery to Brewery ride is an excellent adventure. It’s a ride from the early dawn in downtown Boston to the late afternoon in rural Vermont. It’s also a ride from “I think I can” to “I know I can” to “I’m glad I did.” At least that’s how it went for my inaugural ride this past Saturday. Thankfully all the weather forecasts of rain, showers, thunderstorms and the like were wrong. 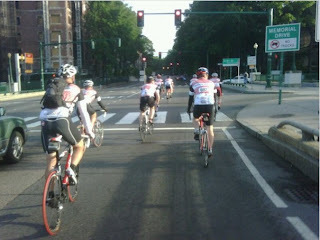 The sun was shining brightly in Boston as we arrived at the start. The ride was very well organized and every detail ran smoothly – from bike and bag drop off, to registration, to corralling riders into groups and launching them off. There was even an optional registration & packet pick up Friday night at the brewery – compete with free beer! The ride out to the first water stop at mile 46 in Townsend was smooth and enjoyable. Our group proceeded at a leisurely pace through the more densely populated areas of Boston, Cambridge and Arlington, and then picked up the pace through Lexington Bedford, Carlisle and along Route 119. After that, the climbing began. Up through Willard Brook and into Rindge, NH, climbing about 1000 feet over the course of nearly 10 miles. From there the route became more rolling until the big climb of about another 1000 feet, this time condensed into about 5 miles from Ashuelot up into Hindsdale. The hills continued to roll on from there with a few good smaller climbs thrown in for good measure. Along the way there were food and water stops that seemed to run smoothly with plenty of port ‘o potties at each. Designed to keep you rolling along, each seemed to feature either simple food choices or just a water refill. Some riders (including my group) also stopped at one of the many convenience stores along the way for additional nourishment. At the end, the prison-style shower setup for the men offered a quick refreshing clean up before heading to the bar-b-que (good food!) to listen to live music and enjoy some well-earned Harpoon beer. Bikes were loaded on trucks and riders onto buses for a two-hour bus ride back to the start. Also, check out the event’s official web page.